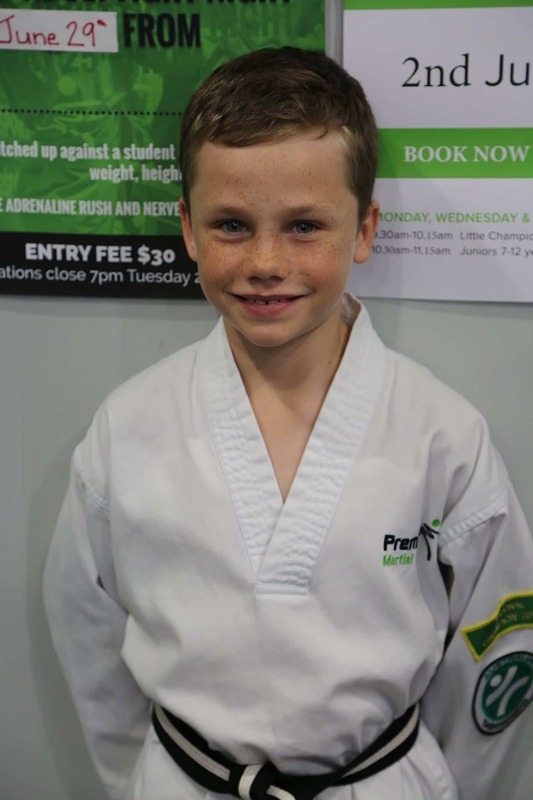 Josh has been training at Premier Academy since 2013, beginning in our Little Champions program at the age of 5. He is currently a Probationary Black Belt, and is training hard in the hope of receiving his Black Belt this year. Josh is an inspiration to all around him due to his dedication to training and his focus on continually improving. Josh loves all aspects of his martial arts training, but finds sparring the most exciting. He has translated this love of sparring into competing very successfully in Olympic Taekwondo. Josh has competed at the local, state and national level, with a personal highlight being winning a National Championship as a Red Belt in 2016. After training in martial arts for over five years, Josh has developed both physically and mentally. He credits his speed in running, as well as improvements in both AFL and cricket, to his martial arts training. When he is not training, Josh enjoys playing sport, hanging out with his friends and listening to his favourite music from Justice Crew.